Ever travel half way across the globe and end up with swollen ankles? Not a very comfortable feeling, especially on holiday! Here is my attempt to explain why and how it occurs, as well as to provide you with some mini tips, to prevent further complications. 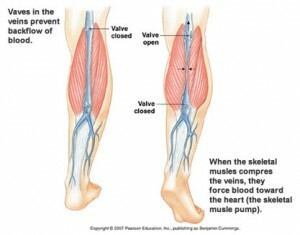 Fluid such as blood usually returns back to the heart from the lower limbs through the veins. This is through the contraction of the muscles,which help push the blood through the veins and the assistance of the valves, which prevent the back flow of the blood, thus aiding with venous function. This can be seen in the diagram below. Whilst flying, we generally tend to be in a seated position with our knees bent. Due to the gravitational pull and lack of movement, an increased amount of blood and other fluids pool at the deep and superficial veins at the feet and ankles, thus causing oedema or swelling in the area. 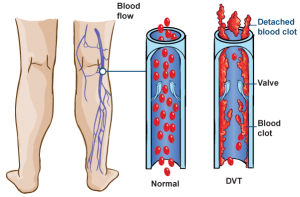 One of the main complications that you may be susceptible to occur through this process is known as Deep Vein Thrombosis (DVT). This is when a blood clot forms in the veins of the lower limbs and may potentially be a risk factor for other conditions such as pulmonary embolism. The diagram below is a simple illustration of the mechanics behind DVT, which will be further explained in another post.